While in the middle of two wars it is easy to forget how capable and ready our military is for humanitarian missions. Unfortunately, it is in a time of a severe tragedy that we get reminded how quickly our military can respond to such a crisis. Each service branch is deploying select units or using their particular expertise to offer relief to the people of Haiti. Below is a partial listing of each branch and how they have been able to contribute. US Coast Guard: Have been evacuating from day one, and are continuing to work on getting critical supplies to the people of Haiti. US Army: Deploying Paratroopers from the 82nd Airborne Division at Fort Bragg. US Navy: Deployed carrier USS Carl Vinson as well as amphibious assault ship USS Baatan that was joined by the USS Fort McHenry and USS Carter. Us Air Force: Members of the 79th Rescue Squadron based at Davis-Monthan Air Force Base participated in a Haitian relief mission during the evening of Jan. Airmen from the Air Mobility Command’s 621st Contingency Response Wing from McGuire Air Force Base will deploy as well as Liaison officers with the Joint Personnel Recovery Center and the 601st Air and Space Operations Center at Tyndall Air Force Base. 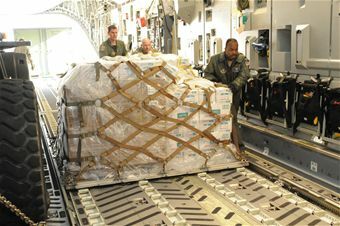 This entry was posted on January 15, 2010 by majastevanovich in Military and Troops News and tagged Disaster Relief, Haiti, Military, US Air Force, US Army, US Coast Guard, US Marines, US Navy.